"We all like to think that there's one person out there who will rescue us from the tower, slide the glass slipper onto our foot, brush away our one fallen tear and tell us if there's six more weeks of winter. Or something like that. But that's not how the real world works." As a "singleton" whose friends are all in relationships, I can definitely say that I've occasionally felt inferior to those happy couples. As a result, it was easy for me to understand our protagonist, Becca - even if I'm not quite as cynical about love as she is. Becca's voice is equal bits skeptical, witty, convincing, and funny, making for an engaging read. While she made a few choices that I didn't agree with, it was really interesting to see how Becca's actions shaped her character growth over the course of the novel. And, of course, it was a lot of fun reading about her exploits as the Break-Up Artist and seeing the creativity that was put into her schemes. 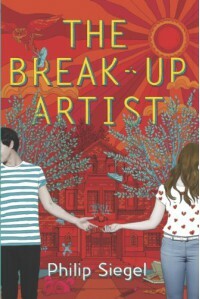 Contrary to popular belief, The Break-Up Artist isn't a romance story. It does critically examine high school relationships, but familial relationships and friendships are given equal exploration. These relationships all had their ups and downs, making them authentic in their imperfections. It also explores the question of what love actually is, and how it can vary from person to person and couple to couple. Overall, The Break-Up Artist was such a cute, fun read that I really didn't want to put down. I can't wait to see what Siegel writes next! Thanks to Netgalley and Harlequin Teen for providing me with an advanced copy of this book in exchange for an honest review.